For media inquiries, please contact Cynthia Meyer at CMeyer@COchamber.com. DENVER – The Board of Directors of the Colorado Chamber of Commerce voted yesterday to support House Bills 1257 and 1258, which would allow voters to decide whether the state can keep excess revenues under the Taxpayer Bill of Rights (TABOR) and allocate one-third each to transportation, higher education and public schools. The bipartisan legislation is sponsored by Colorado House Speaker KC Becker, Rep. Julie McCluskie, Sen. Lois Court, and Sen. Kevin Priola. The Colorado Chamber of Commerce was created in 1965 based on the merger of the Colorado Chamber and the Colorado Manufacturers’ Association. 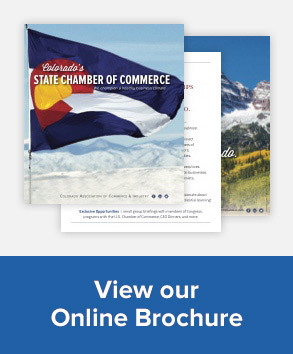 It is the only business association in Colorado that works to improve the business climate for all sizes of business from a statewide, multi-industry perspective. As a private, non-profit organization, the Colorado Chamber’s work is funded solely by its members.